I know I've been a bit MIA lately. Sorry. I spent the day working on my resume. I am going to apply for a part time job at Hazel's school. We also have a bunch of family activities planned the next week or so, therefore I may be MIA a bit more. So I saw this great idea on Our Life in a Click using Starbucks cups. Now I have to admit I'm addicted to chai lattes and I love Starbucks, so we have a few cups floating around. In fact when Hazel first started speaking she called Starbucks "Chai". She also has several empty cups floating around so she can pretend to drink a chai as well. Therefore, this craft was right up our alley. I made a few changes. I did not have the wooden discs so I used the plastic cover. I cut the circle and added the face. To make it stand I used one of the green drink sticks they now have so your drink does not spill in the car. I poked it through the bottom of the cup and put glue on it and around it and glued the cover circle on it. I blocked it in the back with some yarn hair. Then I used a glittery pipe cleaner for the halo. I honestly did this craft with Hazel in about 10 minutes. 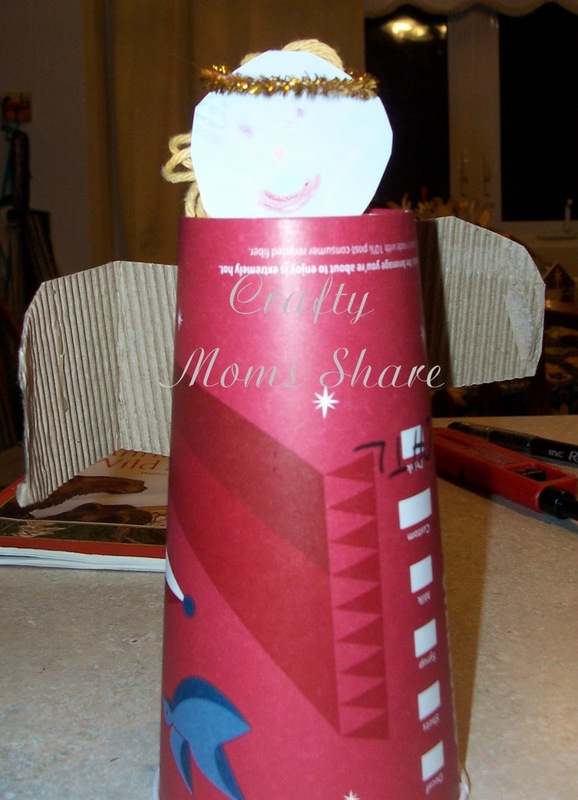 Tomorrow we are going to use different size cups to make an angel family. I'm also thinking maybe a Christmas tree. I have an idea in my head. I'll share it tomorrow if we do it. Have you done any recycled crafts lately? 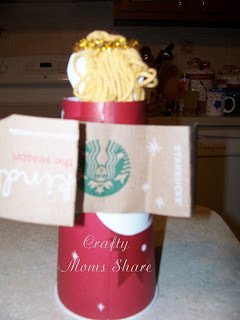 Any other creative ideas for using your coffee cups and its various parts?